The human body is made up of biological systems that include organs and tissues which include muscles. 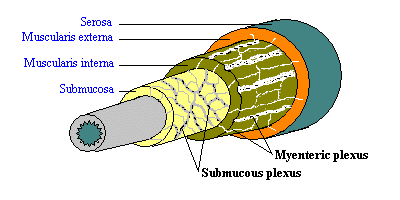 A muscle is a tissue that comes from the mesodermal layer of germ cells. It contains filaments that contract and change the size of cells as they move past each other. It produces force and causes an organ or organism to move. It is powered by the oxidation of fats and carbohydrates together with anaerobic chemical reactions of fast-twitch fibers. Movement can either be voluntary such as eye movement or the movement of the quadriceps muscles, or involuntary such as the contractions of the heart. ï¿½ Cardiac muscle, which is an involuntary muscle that is found in the heart. It occurs with unconscious thought and is very important for the survival of an organism. Like skeletal muscle, it contains sarcomeres in a regular arrangement of bundles that contract and relax in short intense bursts. ï¿½ Smooth muscle, which is also an involuntary muscle that is found within the walls of organs like the stomach, intestines, uterus, bronchi, bladder, esophagus, urethra, blood vessels, and the arrector pili of the skin that controls the erection of body hair. It is different from skeletal muscle because it is not under conscious control and is not striated. 1. Type I or low twitch muscle, which has high levels of mitochondria and myoglobin. They carry more oxygen and have a red appearance. – Type IIa, which appears like a smooth muscle and has a red appearance. -Type IIx or Type IId, which is the fastest muscle type in humans. -Type IIb, which is white muscle and has very low levels of mitochondria and myoglobin. It is the major fast muscle in small animals such as rats. Smooth muscles and skeletal muscles have different structures, functions, contraction regulation, and excitation-contraction coupling. Smooth muscles are single unit varieties; the whole muscle either contracts or relaxes. Both of these muscles are essential for the movement and survival of organisms. Any deterioration in muscle mass and functionality can gravely affect the overall health and well-being of an individual or an organism. 1. Smooth muscles are not striated while skeletal muscles are striated. 2. Smooth muscles are an involuntary muscle while skeletal muscles are voluntary muscles. 3. Smooth muscles are not under conscious control while skeletal muscles are under conscious control. 4. Smooth muscles can be found within the walls of the internal organs like the stomach and the uterus while skeletal muscles are found in the biceps of the arm, the chest, and other muscles that can be moved. Emelda M. "Difference Between Smooth Muscles and Skeletal Muscles." DifferenceBetween.net. March 13, 2018 < http://www.differencebetween.net/science/difference-between-smooth-muscles-and-skeletal-muscles/ >.